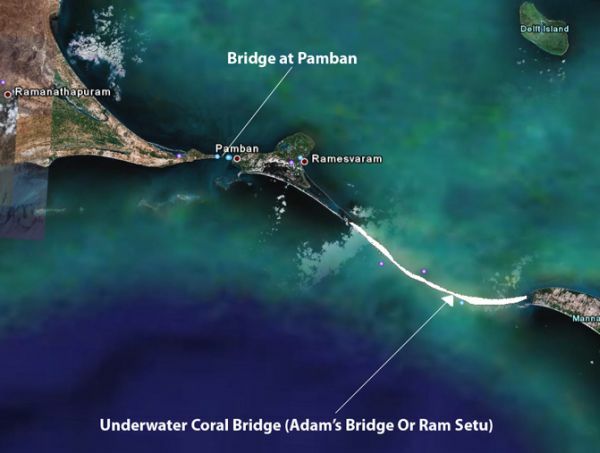 Adam’s Bridge (Tamil: ஆதாம் பாலம் ātām pālamm, Sanskrit: रामसेतु, rāmasetu), also known as Rama’s Bridge or Rama Setu is a chain of limestone shoals, between Pamban Island, also known as Rameswaram Island, off the southeastern coast of Tamil Nadu, India, and Mannar Island, off the northwestern coast of Sri Lanka. Geological evidence suggests that this bridge is a former land connection between India and Sri Lanka. Ramayana describes the construction of a bridge from India to Sri Lanka (1.2 million years ago). The fabled bridge that was constructed by an ape race on the orders of Lord Rama, in the Treta yuga, which according to Indian time or yuga cycles, happened 1.2 million years ago, was discovered by a NASA space satellite. It has been dated 1.2 million years, thus putting it in the time-frame of it’s so-called construction. The bridge, called Adams bridge, a 30km long chain of shoals has been characterized to have a man-made structure. Geological Survey of India (GSI) carried out a special programme called “Project Rameswaram” that concluded that age data of corals indicate that the Rameswaram island has evolved since 125,000 years ago. The Ramayana attributes the building of this bridge to Rama in verse 2-22-76, naming it as Setubandhanam, a name that persists until today. Rama was followed by his younger brother Lakshmana and an army of Vanaras(monkey shaped humans) lead by their king Sugreev and minister Hanuman. They had 2 chief engineers Nal and Neel, who planned the entire architecture of this bridge, so that Rama can reach lanka and kill Ravana, who kidnapped his wife Seetha. That immense causeway constructed by Nala in the bosom of the sea was built by the arms of those monkeys of formidable exploits and it extended over a hundred leagues. Some brought trunks of trees and others set them up; it was by hundreds and thousands that those monkeys, like unto giants, made use of reeds, logs and blossoming trees to construct that bridge, rushing hither and thither with blocks of stone resembling mountains or the peaks of crags, which, flung into the sea, fell with a resounding crash. The first day those monkeys resembling elephants, or immense energy, full of high spirits and exceedingly merry, erected fourteen leagues of masonry. The second day, those highly active monkeys of formidable stature set up twenty leagues. Bestirring themselves, those giants threw twenty-one leagues of structure over the ocean on the third day and on the fourth, working feverishly, they built up twenty-two leagues in extent. The fifth day, those monkeys, industrious workers, reached to twenty-three leagues distance from the further shore. That fortunate and valiant son of Vishvakarma (architect of the demigods), leader of the monkeys, constructed a causeway worthy of his sire over the ocean and that bridge erected by Nala over the sea, the haunt of whales, dazzling in its perfection and splendor, was like the constellation of Svati in space. Then the gods, Gandharvas, Siddhas (living beings superior to humans) and supreme Rishis (great sages) assembled in the sky, eager to see that masterpiece, and the gods and Gandharvas gazed on that causeway, so difficult of construction, that was ten leagues in width and a hundred in length built by Nala. Those monkeys thereafter dived, swam and shouted at the sight of that unimaginable marvel that was almost inconceivable and caused one to tremble! And all beings beheld that causeway thrown over the ocean and by hundreds and thousands of kotis (millions), those monkeys, full of valor, having built that bridge over the immense repository of waters, reached the opposite shore. Vast, well-constructed, magnificent with its wonderful paved floor, solidly cemented, that great causeway like unto a line traced on the waves, resembled the parting of a woman’s hair“. The bridge is 18 miles (30 km) long and separates the Gulf of Mannar (southwest) from the Palk Strait (northeast). Some of the sandbanks are dry and the sea in the area is very shallow, being only 3 ft to 30 ft (1 m to 10 m) deep in places, which hinders navigation. It was reportedly passable on foot up to the 15th century until storms deepened the channel. Temple records seem to say that Rama’s Bridge was completely above sea level until it broke in a cyclone in AD 1480. The sea separating India and Sri Lanka is called Sethusamudram meaning “Sea of the Bridge“. Maps prepared by a Dutch cartographer in 1747, available at the Tanjore Saraswathi Mahal Library show this area as Ramancoil, a colloquial form of the Tamil Raman Kovil (or Rama’s Temple). Another map of Mughal India prepared by J. Rennel in 1788 retrieved from the same library called this area as “the area of the Rama Temple“, referring to the temple dedicated to Lord Rama at Rameswaram. Many other maps in Schwartzberg’s historical atlas and other sources such as travel texts by Marco Polo call this area by various names such as Sethubandha and Sethubandha Rameswaram. The western world first encountered it in “historical works in the 9th century” by Ibn Khordadbeh in his Book of Roads and Kingdoms (c. AD 850), referring to it is Set Bandhai or “Bridge of the Sea“. Later, Alberuni described it. The earliest map that calls this area by the name Adam’s bridge was prepared by a British cartographer in 1804, probably referring to an Abrahamic myth, according to which Adam used the bridge to reach a mountain (identified with Adam’s Peak) in Sri Lanka, where he stood repentant on one foot for 1,000 years, leaving a large hollow mark resembling a footprint. Adam’s Bridge starts as chain of shoals from the Dhanushkodi tip of India’s Pamban Island and ends at Sri Lanka’s Mannar Island. 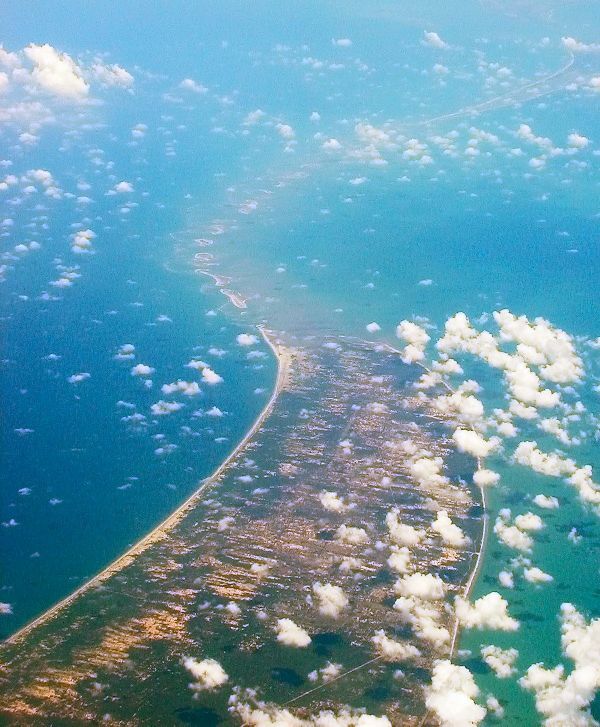 Pamban Island is semi-connected to the Indian mainland by 2 km long Pamban Bridge. Mannar Island is connected to mainland Sri Lanka by a causeway. The border between India and Sri Lanka is said to pass across one of the shoals constituting one of the shortest land borders in the world. Adam’s bridge and neighbouring areas like Rameswaram, Dhanushkodi, Devipattinam and Thirupullani are mentioned in the context of various legends in Ramayana. Pamban Island (Tamil Nadu, India) with its small port of Rameswaram is about 2 km from mainland India. The Pamban Bridge crossing the Pamban channel links Pamban Island with mainland India. It refers to both: a road bridge and a cantilever railway bridge. Small boats would go below the 2065 m long road bridge and the railway bridge would open up. A ferry service linked Dhanushkodi in India with Talaimannar in Sri Lanka. The service was part of the Indo-Ceylon Railway service during the British Rule. One could buy a railway ticket from Chennai to Colombo, whereby people travelled by rail from Chennai to Pamban island, go by ferry to Talaimannar, and then go again by rail to Colombo. In 1964, a cyclone completely destroyed Dhanushkodi, as a train was about to enter the station. The tracks and the pier and heavily damaged along the shores of Palk Bay and Palk Strait. Dhanushkodi was not rebuilt and the train then finished its journey at Rameswaram. There was a small ferry service from there to Talaimannar, but it was suspended around 1982 because of the fighting between Sri Lankan government forces and the separatist LTTE.